Primary/Secondary plumbing has been used for years in commercial and residential heating and cooling applications. In a radiant heating application, a properly sized pump on the Primary Loop triggers the on-demand heater whenever any zone calls for heat. This creates a circulating loop of hot water between the heater and a pair of closely spaced tees that intersect with a Secondary Loop. In effect, the closely spaced tees become the “heat source” for the radiant Zone Manifold via the Secondary Loop. When a radiant zone calls for heat, hot water is drawn from the closely spaced tees and sent to the radiant tubing. Primary/Secondary plumbing solves a couple of problems. One, it prevents overheating of certain types of boilers by guaranteeing that the proper amount of fluid is always circulating through the system’s internal heat exchanger — even if only a small zone (i.e. low flow) is calling for heat. Also, for very large zones, the Primary/Secondary plumbing prevents the heater from becoming a “choke point” in the radiant system. In other words, the heater may have plenty of heating power (i.e. high BTU output), but the inlet and outlet ports are too small to pass the large volume of water required by a large radiant system. Important note: For relatively small radiant systems, those using less than 3,000 linear feet of 7/8″ XL PEX, Primary/Secondary plumbing isn’t necessary. Unless, as stated above, a specific boiler manufacturer requires Primary/Secondary plumbing to protect the unit’s internal heat exchanger. Takagi on-demand water heaters, for example, do not require Primary/Secondary plumbing. Nevertheless, it would be a huge mistake to run even a modest radiant floor system directly off the water heater. Again, it comes back to flow. The inlet and outlet ports of on-demand units are tiny and that restriction can “choke” the flow rate needed by the radiant floor. For this reason, a properly sized three-way mixing valve is installed between the on-demand heater and the radiant floor Zone Manifold. With this configuration, the radiant circulator pump(s) draw from the “mix” port, a combination of the “hot” port of the mixing valve (the line from the heater) and the “cold” port of the mixing valve (a tee off the line returning from the floor to the heater) solving the volume/flow problem. Tiny ports no longer matter because only a small amount of heated water is required from the on-demand heater — for the simple reason that the floor water returns to the heater only ten degrees cooler than when it left. In other words: The water going to the radiant pumps is mostly the very same water that just returned from the floor — with a small injection of hot water from the on-demand heater (remember the ten degrees we used to heat the zone?). The horizontal pipe at the top of this photo is the heart of the secondary loop. The right end of this pipe will connect to the supply side of the radiant Zone Manifold. The left end receives the return fluid from the Zone Manifold. This secondary loop can be sized to accommodate even the largest radiant system. Of course, in order for the Primary/Secondary plumbing configuration to work properly, the spacing of the tees intersecting the secondary loop must follow specific plumbing guidelines. The same is true of the straight lengths of pipe on either side of each tee. Important: Never cut either of the two stubs soldered into the closely spaced tees. While sometimes, especially in tight installation situations, it is tempting to “trim” the straight copper stubs extending from the closely spaced tees…DON’T DO IT! It is VERY important that the closely spaced tees be no further apart than 4 times the diameter of whatever size pipe constitutes the primary/secondary loop, and it is equally important that the length of the straight pipes extending from the closely spaced tees be at least 6 times that same pipe diameter. In other words, if, say, the primary/secondary loop is assembled using 1″ diameter pipe, the closely spaced tees must be no wider than 4″ center to center, and the straight pipes on both ends of the tees must be at least 6″ long. Cutting the stubs in order to “make the package fit” into a tight area imbalances the relationship between the primary and the secondary loop. I could go into an elaborate physics lesson and explain why these parameters must be followed (actually, I couldn’t), but suffice to say that the plumbing industry has spent years formulating these rules. They work. And because the object of primary/secondary plumbing is to prevent “pressure drop” between various pumps within the same system, violating the above rules will open the door to a variety of undesirable and chaotic flow events. For this reason, Radiant Floor Company pre-assembles the Primary/Secondary plumbing package in our shop. This eliminates any guesswork during installation and provides the customer with an easy to assemble, fully labeled package system with virtually all the soldering done by us. It’s okay to add more straight pipe, or an elbow, to the stubs soldered into the closely spaced tees, but never cut them. The primary/secondary plumbing configuration can also be designed to provide domestic hot water. 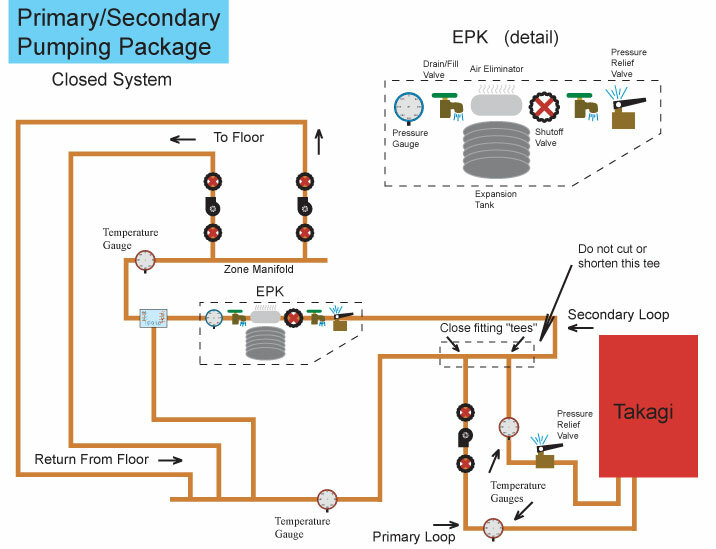 In this application, two mixing valves are installed in the system, one for the radiant zones (see schematic) and a second that feeds the domestic hot water supply. In this way, two temperature gradients are possible from the same heat source. And, like any other open system, stagnation is prevented by introducing fresh water into the heating system, via the floor, every time domestic hot water is used. The schematic below illustrates the piping configuration when Primary/Secondary plumbing is used in a “closed” system, that is, when the heat source is dedicated to radiant floor heating and isn’t providing domestic hot water.